Drones have made headlines recently, raising concerns about public safety and privacy. As part of a new national initiative, UTA is addressing those issues while working to make these vehicles fit for the friendly skies. Brian Huff and Atilla Dogan (far left) watch as a student launches a UAV test flight. The engine of a small, unmanned aircraft whirs suddenly to life on a stretch of field near the UT Arlington Research Institute (UTARI). Inside the plane, a sensor keeps it stable as it slowly climbs into the air. The vehicle begins to maneuver in the wind as if it knows what to do all by itself—which, in fact, it does. The plane tilts skyward and is soon a silent, winged speck gliding 400 feet above. Now the mission begins. The plane’s guidance system has been pre-programmed with computerized commands that include altitudes to reach at specific GPS locations, waypoints to cross, and instructions to follow about shooting video with an on-board camera. All the while, the aircraft stays absolutely within a prescribed area at UTARI along the bottom of the eastern Fort Worth Trinity River, as outlined by a Federal Aviation Agency certification of authorization. Though the wind blows at a modest 15 mph at ground level, its direction shifts and velocity increases slightly a few hundred feet above. The plane’s sensors detect these changes and adjust accordingly—and near instantly—as the vehicle quickly passes a series of waypoints dead-on before descending and landing perfectly a few minutes later. Mission accomplished—for now. There are hundreds, perhaps thousands, more unmanned aerial vehicle (UAV) tests to come before these flying robots become a common sight in the sky. The Association for Unmanned Vehicle Systems International predicts that, once the aircraft are allowed in general airspace, the industry will create 100,000 jobs and generate $82 billion in economic activity in the decade that follows. Lynch himself already has a list of more than 800 possible commercial, non-military applications for the aircraft. Researchers are using UTA's blimp to work on ground/aerial cooperative sense-and-avoid systems. But before UAVs’ full potential can be tapped, there are numerous safety, privacy, and even philosophical issues to be solved. The industry is still in its infancy and lacks many concrete rules and regulations. Outside a few limited areas like UTA’s certified testing site, unmanned aircraft aren’t allowed in U.S. airspace unless they are directly controlled by a visual ground pilot within eyeshot. Even then, they can only be used for limited purposes. The Federal Aviation Administration plans to begin crafting national safety rules and regulations for UAVs by early 2015 and has commissioned six university-dominated teams to research and develop proposals for the burgeoning industry. 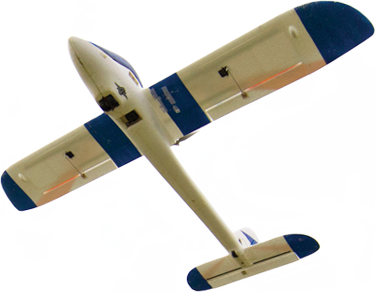 The Lone Star Unmanned Aircraft Systems Initiative is one such team and comprises UT Arlington; Texas A&M University–Corpus Christi (the consortium leader); Texas A&M Engineering Experiment Station; Camber Corp. of Huntsville, Ala.; the Southwest Research Institute in San Antonio; and other research institutions and private-sector companies. 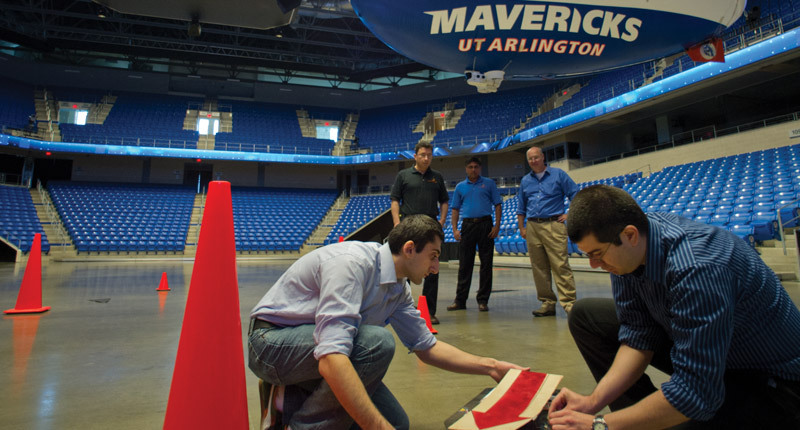 UT Arlington’s areas of focus are decision and control systems, dynamic modeling, collision avoidance, positioning, and similar issues related to the high-performance human interactions and safety of unmanned or remotely piloted aircraft. The research team includes Frank Lewis, the Moncrief-O’Donnell chair at UTARI and an electrical engineering professor; Kamesh Subbarao and Atilla Dogan, both associate professors of mechanical and aerospace engineering; and Brian Huff, an associate professor of industrial and manufacturing systems engineering. They will conduct experiments and develop test beds, hardware, software, and algorithms to enable the safe and reliable deployment of UAVs for civilian, law enforcement, military, and other uses. That phrase—“sense and avoid”—comes up a lot in UAV research. “It’s easy enough to get a vehicle from here to there, but keeping it from being hit, hitting other objects, or interfering with conventional aviation is the big challenge,” Dr. Subbarao explains. His research deals with position determination of UAVs using an exotic array of sensors aimed at predicting conflict and avoiding collisions. Dr. Dogan, similarly, is working on obstacle detection and conflict avoidance, as well as trying to predict hybrid airspace interactions for a future where manned and unmanned aircraft coexist. Dogan notes that at the most advanced level, an unmanned aircraft operates autonomously—albeit with a ground control override function. To that end, other aspects of Subbarao’s work involve technologies to help UAVs navigate efficiently when GPS information is lacking and programs to help a damaged aircraft make its own decisions about landing safely. “The bottom line is that these vehicles must be as fail-safe as possible,” Subbarao says. As part of its work, the research group is experimenting on the University’s official “airship,” a helium-filled blimp familiar to those who’ve attended basketball and volleyball games at College Park Center. A ground pilot usually flies it by hand, but Dogan and Dr. Huff are outfitting the blimp and a new model plane with programmable computers that will provide them with their own autonomous piloting systems. Though the tiny computer weighs less than four ounces, it could probably be modified to fly a Lear jet, were it required. One of Huff’s fortes is finding affordable solutions to research challenges, whether that involves overseeing the construction of specific equipment for unique devices or locating inexpensive, publically available equipment like the aforementioned computer-guidance system. He’s also keenly interested in developing low-cost tracking systems that would provide identification, position, and flight paths of UAVs for the national air traffic monitoring system. While the research institute has ongoing communications with several unmanned aircraft system firms, manufacturers, software writers, and developers, much work must be done before companies can fly their commercial UAVs in national airspace. Brian Huff, Kamesh Subbarao, and Atilla Dogan inspect a student's aircraft. And so UTARI’s researchers keep flying their UAVs within the FAA-regulated area on campus. (The space soon will be expanded to include old helicopter ports near Mineral Wells and less populated areas around Caddo Mills, as well as other locations.) Each flight registers successes—and sometimes failures—that, collectively, increase safety and confidence in the aircraft. Eventually, there will be enough data to open the skies to a new breed of vehicles. 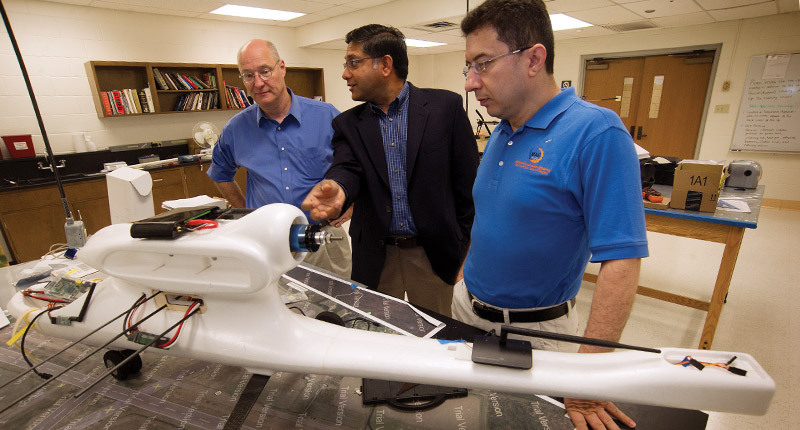 All members of UT Arlington’s Lone Star Unmanned Aircraft Systems Initiative team agree that the first extensive, non-military uses of UAVs likely will involve relatively simple aerial imaging and automated data collection flights in tightly defined geographies. Initial users probably will be entities like realtors seeking aerial pictures of properties, search-and-rescue teams looking for a lost child, ranchers counting their herds, or governmental agencies monitoring forest fires or flooding more efficiently and safely than conventional, piloted aircraft could.